While three out of four mothers start their newborn on breast milk, not many continue past a few months. The American Association of Pediatrics recommends that babies be breastfed for a minimum of one year while the World Health Organization recommends exclusive breastfeeding for the first six months with continued breastfeeding up to two years and beyond. According to a recent study from the Centers for Disease Control & Prevention, only 16.3 percent of babies are exclusively breastfed at six months, with 25.5 percent still receiving breast milk at 12 months. Some mothers fear that they don’t produce enough breast milk for their baby. If milk supply has been established, then a drop in milk production is more likely to happen during the first few days upon returning to work from maternity leave, during times of stress, from restricting calories or from exercising too much. 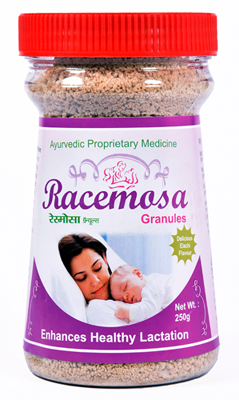 Benefits of RACEMOSA Granules: 1. Boosts postpartum health and enhances the production of breast milk in lactating mothers. 2. Restore hormonal balance in women 3. Important source of iron, folic acid, calcium, vitamins C, E and A. Because of its high iron and protein content, it is often given post-partum to lactating mothers . 4. Increases milk production and secretion in lactating mothers. It is also popular as a herb that enhances fertility and regulates the menstrual cycle. With an estrogenic effect on the female mammary glands and reproductive system, Shatavari boosts postpartum health and enhances the production of breast milk in lactating mothers. It has anti-ulcerogenic and gastroprotective properties. The most common benefits of Ashwagandha for women are that it reduces anxiety and stress levels, keeps a check on hormone levels, treats sterility, increases release of milk for lactating mothers, improves sexual health, treats irregular periods, and treats urinary infections or disorders. Special Precautions & Warnings: Pregnancy and breast-feeding: Do not use ashwagandha if you are pregnant. It is rated LIKELY UNSAFE during pregnancy. There is some evidence that ashwagandha might cause miscarriages. Not enough is known about the use of ashwagandha during breast-feeding. Stay on the safe side and avoid use. Gokshura facilitates the outflow of toxins accumulated in the first and second chakras. Its diuretic action flushes the urinary tract while also nourishing and moistening the mucous membranes. It rejuvenates the reproductive glands, enhances sexual virility, and balances the hormonal levels of the nervous system promoting longevity. any reports suggesting that licorice taken during pregnancy may cause lower IQ in the child. It is also reported that licorice may cause preterm labour. Hence it is not advised to consume during pregnancy. Being rich in iron, jeera water is exceptionally good for pregnant and lactating women. It helps in meeting up the requirements of iron in the would-be mother as well as the fetus or the baby. As a result, both of them remain well and healthy. important source of iron, folic acid, calcium, vitamins C, E and A. Because of its high iron and protein content, it is often given post-partum to lactating mothers . Increases milk production and secretion in lactating mothers. It inceases strength, glow, memory, beauty and fortune. It is specially useful after delivery increasing lactation and for avoiding puerpural disorders.